With its thick, luxurious texture and complex woven appearance, entrelac makes any crocheted item look more impressive. Many styles use multiple yarn colors to create an explosion of color and pattern. Entrelac can be worked flat or in the round, so you can use it for everything from socks to blankets. Entrelac originated as a knitting technique that uses interconnected squares or diamonds to create a basket-weave look. While knitted entrelac uses knit and purl stitches, crocheted entrelac uses the Tunisian stitch. The resulting fabric is thick and dense, so it adds an extra layer of comfort to a hat, sweater or afghan and also makes a great background for applying appliques. 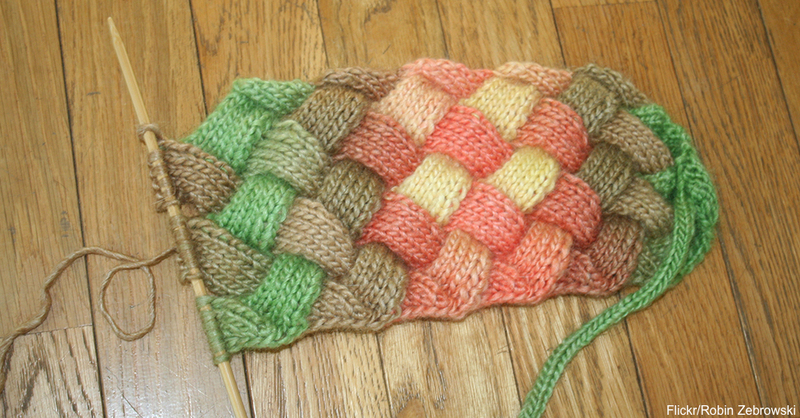 To complete a crocheted entrelac piece, you must have a solid understanding of the Tunisian stitch. This method, which uses a combination of crochet and knitting techniques, requires a long crochet hook with a stopper at one end that prevents the stitches from slipping off. These hooks are usually called afghan hooks or Tunisian crochet hooks. The process starts with a foundation chain that matches the width of your square; from there, you use simple stitches, chains and slip stitches to create the full square. Each row works back and forth, so you never need to turn the piece. Crocheted entrelac items give you the freedom to work in the round or in rows. When working in the round with a two-color pattern, you start with the central square. From there, you add adjoining squares in the second color and then fill in the gaps with the first color, continuing this process until the item is complete. This method is similar to working a granny square. If you prefer to work in rows, you start at one side of the item and work across the garment, alternating colors as you go. Once you get the hang of entrelac crochet, you can apply the technique to almost any item, including dolls and scarves. To make the process more challenging, use four or five yarn colors — more colors translate to a more dramatic piece. A number of free patterns are available online, or you can make your own using a piece of graph paper to denote individual square colors.If you have an afghan hook and a basic mastery of the Tunisian stitch, you have all the tools you need to learn entrelac. With a bit of imagination, you can add an exciting pop of geometric pattern and color to any crocheted project. To get started, check out the basics of how to do the Tunisian stitch.